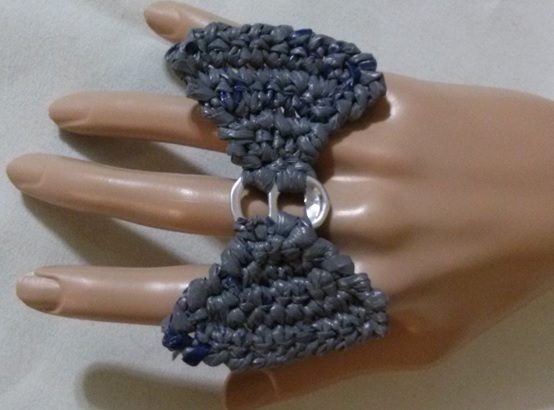 Has anyone ever asked what is the inspiration behind one your designs? Don't laugh .... 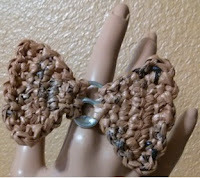 I was inspired to create the Pop Tab Bow Ring after watching a recent episode of 'Jerseylicious'. The show itself doesn't do anything for me but I love tuning in to see what jewelry Tracey and Olivia will be wearing. 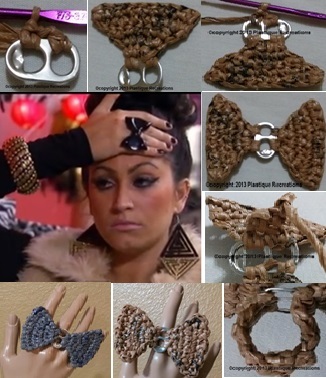 The earrings are so big they look heavy enough to rip right out of their ears and the rings almost swallow up the whole hand. 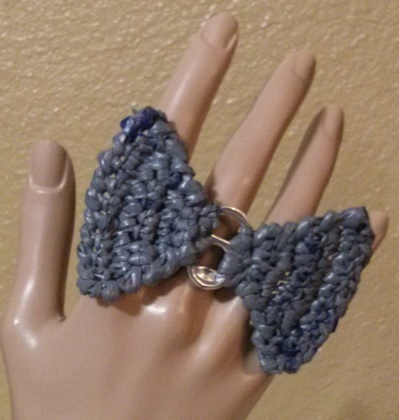 So when I saw Tracey wearing this big bow ring I just had to make one for myself. *Foundation: Join plastic yarn aka plarn with a slip stitch in a hole of the pull/pop tab, single crochet in same hole and single crochet in next hole, turn. Row 4: Chain 1, Chain 1, 2 single crochet in first stitch, single crochet in next 6 stitches and 2 single crochet in last stitch, turn. 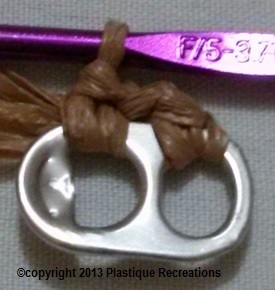 (10) Fasten off, weave in ends. *Repeat on opposite side of pop tab. 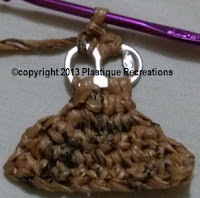 *With wrong side facing you, join plarn with a slip stitch through existing stitch, single crochet in same space, single crochet in next hole through existing stitch, turn. Chain 1, single crochet in both stitches for 5 rows. DO NOT BIND OFF, remove hook making a big enough loop so you don't lose the stitch. *Repeat on opposite for 5 rows. Do a quick fitting. When completed, on one side complete stitches and weave in loose end. 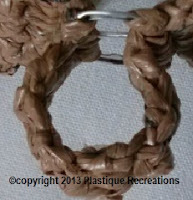 On the other side fasten off leaving long enough tail to whip stitch both ends together. 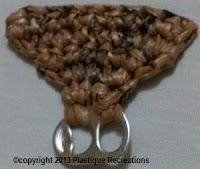 When completed, on one side complete stitch and weave in loose end. 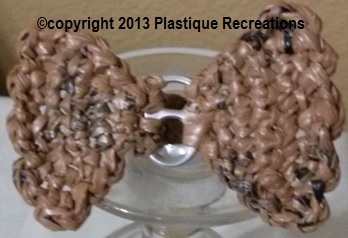 On the other side fasten off leaving long enough tail to whip stitch both ends together. The gray bow was edged using the reverse single crochet by joining the plarn with a slip stitch at the foundation row then reverse single crochet stitch in each end row stitch around back to the foundation row. Repeat on the opposite side. 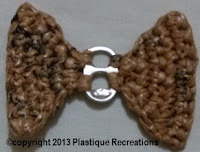 The brown bow was edged by joining plarn with a slip stitch at the foundation row, *chain 1, slip stitch in next end row stitch. *Repeat around to back to the foundation row. Repeat for the opposite side. Optional but recommended: After creating the design I noticed the bow didn't want to lay flat. It kept bending up. 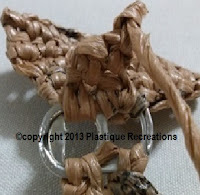 To remedy this, use the extra matching plarn and needle to stitch the foundation row to the top of the ring. I found this did the trick. Wear it proudly or gift it to a 'Olivia' or 'Tracy' you know!!! Hi, I made some rings similar to this using pop tabs. store, so I would have topaz, ruby, emerald etc depending on what design I put on. My nieces love getting these.